we have helped thousands of customers realize the home of their dreams with custom shutter design and installation. See below for some of the most commonly asked questions about our company, as well as questions about shutter quality, manufacturing, installation, and pricing. Stewart Shutters has been in business since 1989 (always under the same company name). 2. Can you provide references in my area? Yes. We can give you references in your nearby neighborhood, or most likely of homes we’ve done on your street! 3. Do you have a show room? Yes, our show room has a variety of shutters on display. 4. What are the hours of your show room? Our regular show room hours are Monday – Friday 8:00 am – 4:00 pm and Saturdays by appointment only. 5. Can you give me a price quote over the phone? Yes. The phone estimate is only a rough estimate; we would still need to come to the house to give you an exact price. 6. What kind of wood do you use for your shutters? We use the highest quality grade of basswood for our shutters. It is a natural solid wood (no finger joint pieces, no MDF or particle wood). Years of use & testing have proven that this type of wood has the best characteristics for manufacturing shutters. 7. Where does your wood come from? All of our wood comes from the Appalachian mountain area on the East Coast. 8. Does everyone use basswood for their shutters? Most shutter companies in Southern California use basswood, but basswood could be finger joint basswood (smaller pieces of wood glued together), or MDF/particle basswood (Saw dust glued together). These types of basswood do not have the same characteristics as natural basswood. Natural basswood is a straighter and more resilient than all other man made materials. 9. Do you offer any other materials besides wood shutters? Experience has proven that quality basswood shutters will out last any other materials. We build our wood shutters to last a lifetime. 10. What are the disadvantages of plastic/vinyl shutters? All vinyl or plastic shutters do not have the strength and characteristics as wood. They are heavier and more flimsy than natural basswood. You can only go up to 20″ wide on most plastic shutters because they will sag due to the heat. There is more wear and tear when you open/close panels due to the weight. It is difficult to refurbish, putty, sand or repair polyvinyl shutters. Most poly or plastic shutters are limited on color choices. 11. What are the advantages of natural wood shutters? Natural wood does not age like other conventional materials. Also due to the life long characteristics of basswood, they can be repainted to update the color to new décor and will be new again and continue to hold up under years of use. 12. What are my choices in paint/stain colors? There are unlimited choices for paint and stain colors. We do provide you a selection of colors, but if you have a specific color you’d like for your shutters, we can match it to a sample provided by the customer. 13. What are your different types of finishes? 14. What are the different choices in louver sizes? We provide louvers in 2.5″, 3.5″ and 4.5″. 15. What size of louvers is the most common? 3.5″ louvers fit nicely on most windows. 16. What are the different choices of hinge finishes? 17. What kind of paint do you use on your shutters? We use a lacquer base primer and a lacquer base top coat paint, which provides an easy to clean finish on your shutters. The lacquer paint gives the shutters durability and a clean finish with a UV protection against the sun’s harmful rays. 18. What types of frames do you use? We have a full milling facility that can make any type of frames. Our standard frames are larger than most companies. They are 1 1/2″ wide by 1 1/8″ thick. 19. Why do you not quote your shutters by square feet? We go by unit price and not by square feet due to the fact that square footage is not accurate and often works out to be more expensive. If you have a lot of windows, we can offer a volume discount. Unit price varies depending on how many windows you do and what is involved. 20. Can I put shutters in my bathroom or kitchen windows? Yes. We can seal coat the shutters with a special sealer that prevents moisture getting into the wood at no additional charge. 21. 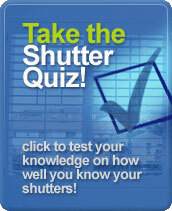 What is the warranty on your shutters? Click here for a detailed explanation of our warranty. Most companies offer the same warranty although warranties are only good for as long as the company is in business. Most companies that build a lower grade shutter, they do not stay in business longer than 2-4 years due to warranty issues. Do your research! Before choosing a company, check to see how long they have been in business, if they have a contractor’s license number and are up-to-date with their contractor’s bonds and license fees. 22. Do you repair or repaint shutters that were not manufactured by your company? 23. How long does it take to get shutters after I have placed a shutter order? We manufacture your shutters to your window size and it is all custom made for your window. It is usually standard to receive your shutters in approximately 6-8 weeks. It can vary due to holidays or seasonal periods. Our prices remain the same year round. 24. How long does the installation take? 25. How do I clean my shutters? Use a feather duster or a 100% cotton cloth and you will see how fun and easy it can be to clean your shutters. 26. Do I have to move any furniture or items away from the windows for the installer? We recommend that you remove any current window treatments (blinds, draperies, valances) and any furniture or breakable items at least 3 feet away from the windows that are being installed. 27. What is the difference between an inside and outside mount? Inside mount is mounted inside of the windowsill and the frames are flushed with the drywall. Outside mount is mounted on the finished wall surface. 28. How are the shutters attached to the wall? By using finished nails. Another option is using screws. 29. How do I adjust shutters that are out of reach? We provide you at no additional charge with a reach rod that has a rubber coated hook at the end of it. This allows you to open and close the shutters that are up high. 30. 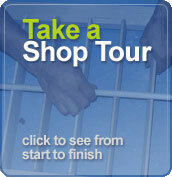 Why should I buy from Stewart Shutters? 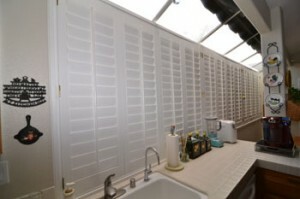 Stewart Shutters is your one stop, quality choice for wood shutters! Your shutter design is great – very simple but quite elegant, it really dresses up a room.